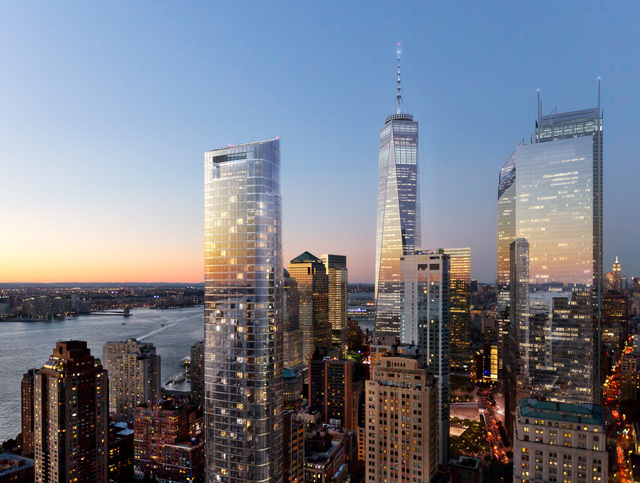 UPDATE: Reps have sent along new information to accompany the images, and “50 West residents will have access to amenities including a full-fitness center/60-foot lap swimming pool, a screening room, a library, as well as studios designated for children and arts and crafts,” and unexpectedly, the project will also have an observatory on the 64th floor, which “will serve as an exclusive entertaining space, offering views of New York Harbor, Ellis Island, and the Statue of Liberty.” Thomas Juul Hansen is designing interiors. 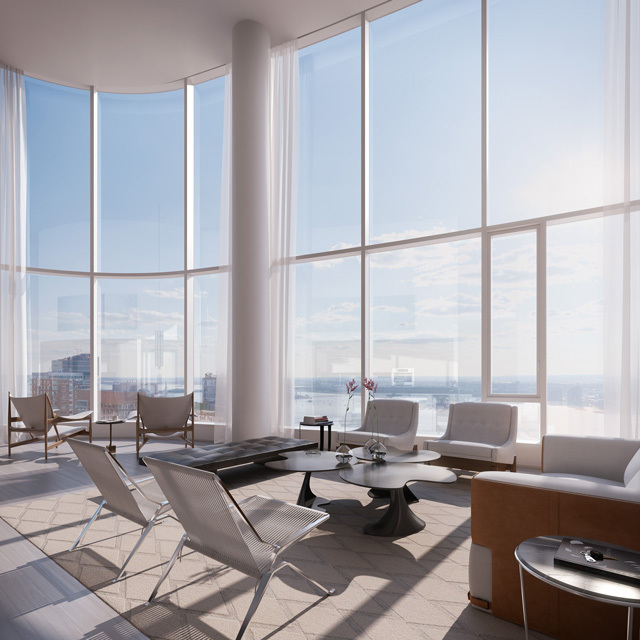 A tipster sent along a slew of new renderings for 50 West Street, which has seen several design revisions over the course of its prolonged conception. As work has resumed at other projects, excavation on the Helmut Jahn-designed tower has been ongoing, and the structure will soon rise above ground level; Time Equities is the developer. 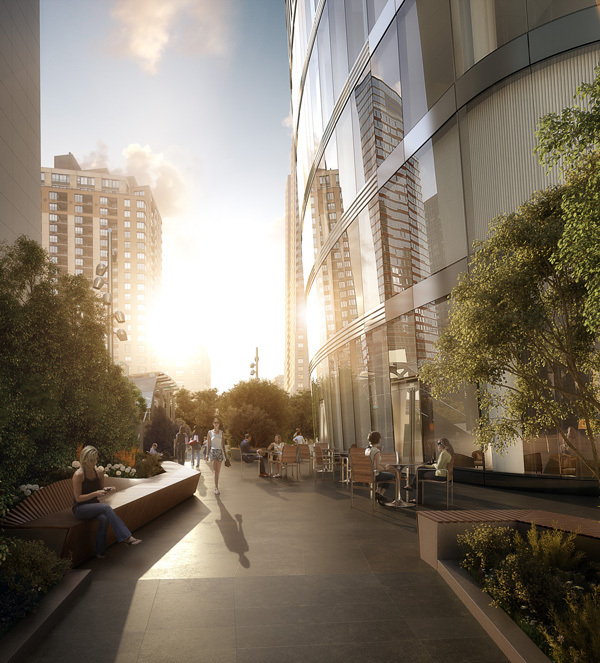 Permits — which were approved earlier this month — indicate that 50 West Street will stand 783′ to its pinnacle. 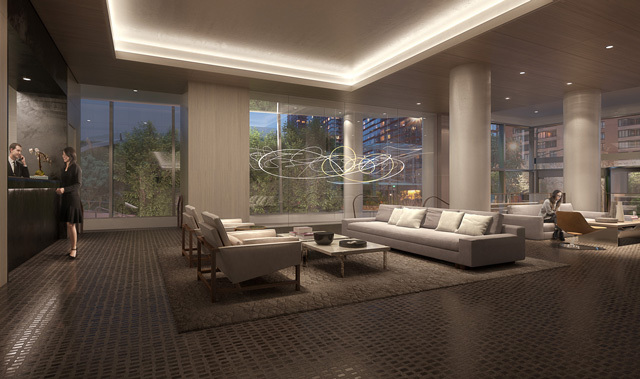 The tower will total 427,177 square feet, with a 21,127 square foot commercial component on the first two levels; at the top, a duplex penthouse spanning 62 and 63 will cap the structure’s 191 condominiums. 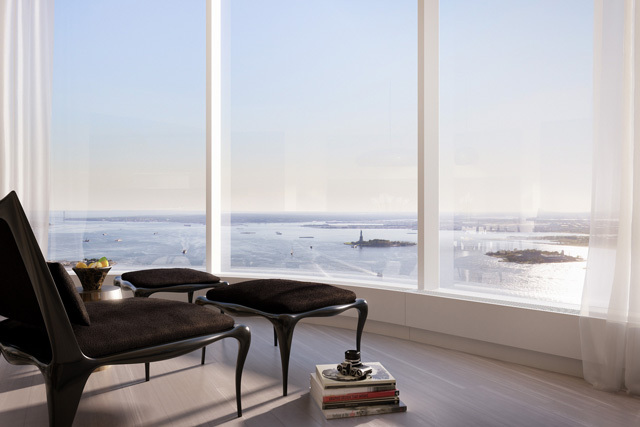 Renderings include the first look inside the tower as well; some units will include double-height living rooms, and views will be sweeping. 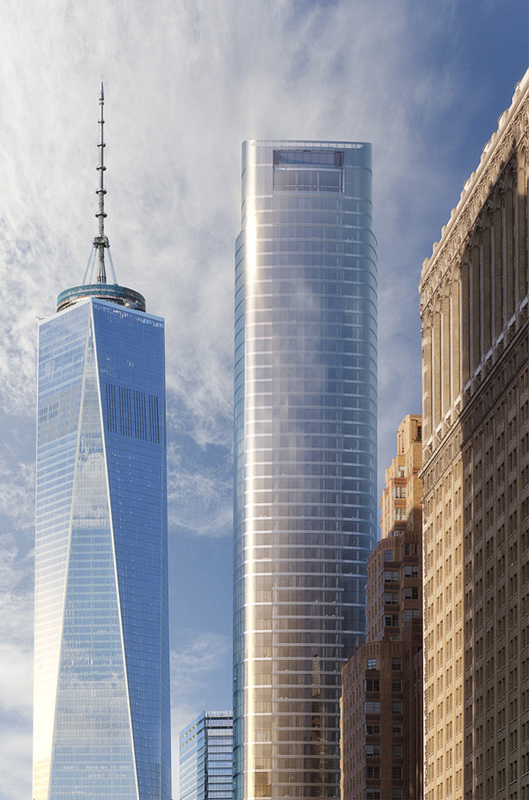 50 West Street will be the tallest building in the immediate vicinity, located just a few blocks south of the new World Trade Center, and well outside any shadows. 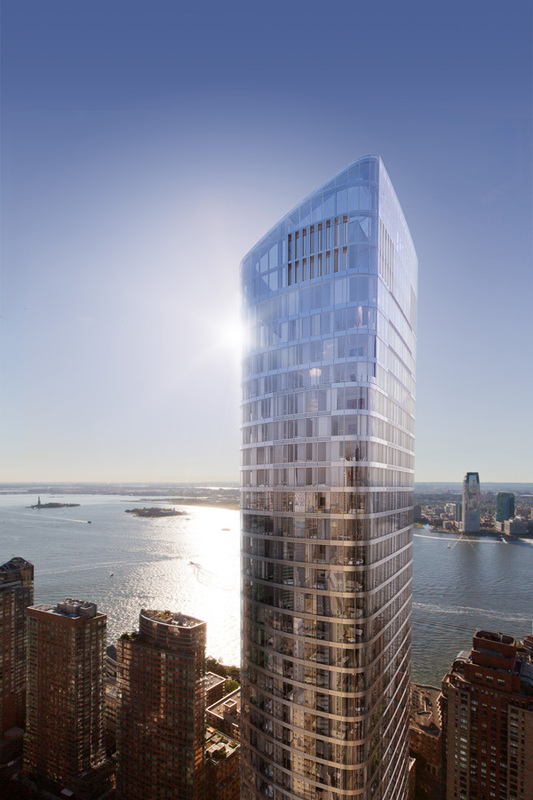 Its relative prominence will be somewhat diminished by the 961′ 22 Thames Street, which will soon rise to the northeast, but it will still rank as one of the tallest residential skyscrapers in New York City. While the vicinity is not particularly friendly to pedestrians, the rise of 50 West will still improve a formerly vacant lot. Next-door, the Battery Parking Garage presents another prime development opportunity, and removing and revitalizing that site would present an opportunity to further improve the neighborhood. 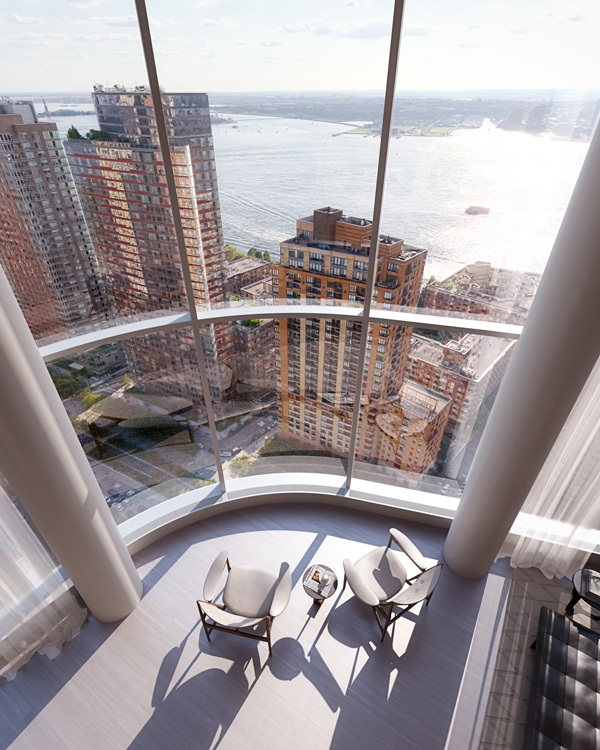 The delay in construction at 50 West Street has resulted in some benefits, as the design has been re-imagined to cope with the threat of potential flooding, made obvious after Hurricane Sandy’s impact on the neighborhood.